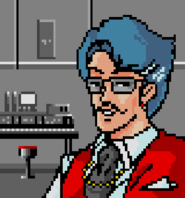 Phantasy Star II features the piano teacher Ustvestia. In the Japanese version of the game, if the character Rolf asks to be taught, Ustvestia charges him less than any other character. In the Japanese version of the game, he also reportedly says of Rolf “He looks cute,” but in the English version of the game says “He looks smart.” This has been read as evidence of this character being more overly gay in the Japanese version than the English version. This entry was posted in 1980s, Changed in localization, Gay, Gay (implicit), Queer Men on September 11, 2015 by Adrienne Shaw.